For some fans of public radio's beloved A Prairie Home Companion, it's all about the wild, unpredictable, "how does he do that?" artistry of sound effects specialist Fred Newman. Hand-picked from nearly two decades of live broadcasts, Sounding Off! spotlights Fred's unique talents in performance with host Garrison Keillor and the hilarious radio acting cast of A Prairie Home Companion. Fred's vocal characterizations are boundless, and his sound arsenal features loons and babies, singing whales and stomping pterodactyls, lovesick elk, patriotic dolphins, rampaging chainsaws, and much more. 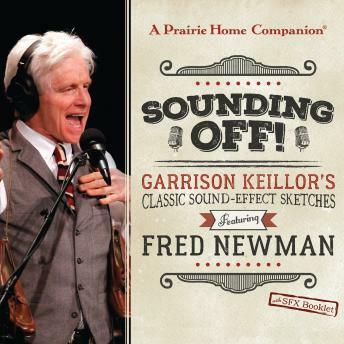 The collectible CD edition features a full-color booklet with photo-essay and notes by Fred Newman, offering a behind-the-scenes tour his sound effects artistry.